A citizen of the world with boundless energy and a genuine passion for human potential, William Arruda has the distinct privilege of having delivered more personal branding keynotes to more people in more places than anyone else on earth! 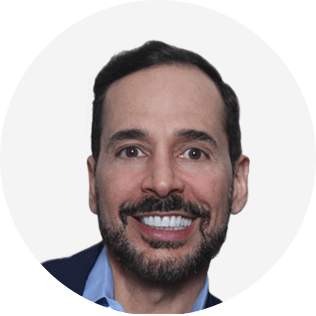 A corporate branding veteran and accomplished entrepreneur, William is the founder and CEO of Reach, the global leader in personal branding with certified executive and career coaches in 49 countries and products that have been used by a million+ people. He is committed to helping coaches expand their success through the power of personal branding. In 2016, he was recognized by the International Coach Federation (ICF) with the Chairman’s Award for his contributions to the field of coaching. William is a personal branding pioneer with more longevity than anyone in the field and has been credited with turning the concept of personal branding into a global industry. He believes that business is a truly human endeavor and has seen first-hand how personal branding ignites potential and bolsters trust, loyalty and engagement. American Express, British Telecom, Gucci, IBM, J&J, Microsoft and Pepsi are just a few in a long list of clients. Audience members leave his high-energy events inspired and ready to take action to increase their success. As a thought-leader on the topics of personal branding and social media, he has appeared on BBC TV, Discovery and NPR and has been featured in countless publications, including Time, Fast Company, the Wall Street Journal and Entrepreneur. William is the bestselling author of the definitive books on personal branding, Ditch. Dare. Do! and Career Distinction and writes a regular column for Forbes. He holds a Master’s degree in Education. Personal branding is increasingly recognized as a must-have skill for every coach. It provides the sense of stability, empowerment, value-creation and recognition you need to succeed in today’s increasingly dynamic marketplace. Personal branding is about being yourself — your best self — in support of your clients and your coaching practice. In this actionable presentation, personal branding guru William Arruda takes you through his proven, three-step personal branding process so you can learn the secrets of building an authentic, unique and compelling brand. He shares powerful tips you can put into action right away so you can stand out, attract the attention of your ideal clients and grow a practice that’s aligned with your authentic self. In a world where people learn about you online before meeting you in person, LinkedIn has become the most powerful tool for expressing your personal brand. Not having a LinkedIn profile sends a message that you aren’t serious about your coaching practice; but just having a profile is not enough. You need to understand how to use LinkedIn to attract the attention of clients and nurture relationships that are important to your success. You need your profile to stand out from the profiles of all other coaches so you can create demand for your unique brand of coaching. You need a LinkedIn connection strategy that will rocket you towards your goals. And you need to know how to use LinkedIn as the nucleus of your comprehensive social media strategy. This innovative presentation – created specifically for coaches – gives you the critical tools you can use to build a stellar profile and use LinkedIn to expand your thought-leadership, build and nurture your network and expand your success. 3. Ways to be efficient with LinkedIn (and other social media) so it doesn’t take over your life!